We even have a relaxation retreat option for your partner, who may want to experience the Garden Route and Tamodi Lodge with you, but do not want to mountain bike! In and around Plettenberg Bay there are many spectacular cycling routes, indigenous forest trails and beautiful scenery make this part of the Garden Route a favourite mountain biking destination. Ride to the sound of the many different bird species in the area, the knysna loerie is one of our regulars. 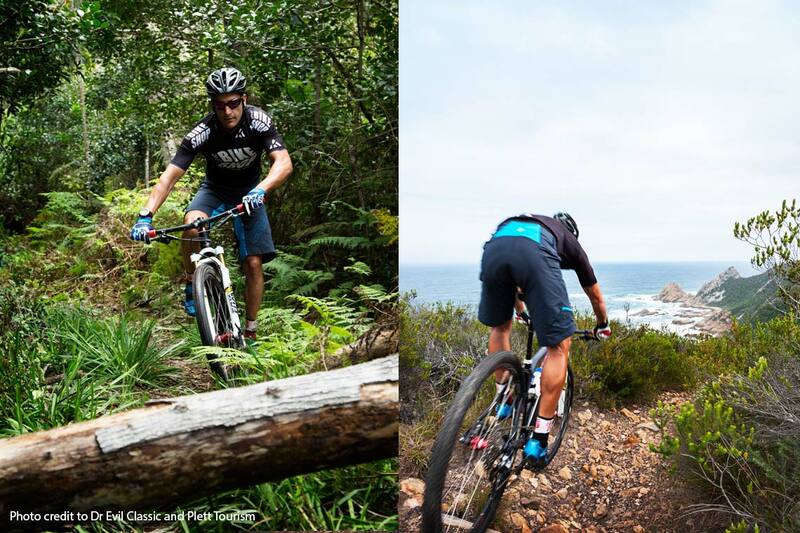 Situated between Knysna and Plettenberg Bay, Harkerville forest is the ideal location for recreational mountain biking. The 4 colour-coded Harkerville Routes offer a different route to suit each level of rider, from an easy family ride to fast-flowing single track . The Yellow Route - This 14km route is an easy ride along flat gravel roads and is just right for younger riders or a family going at a slower pace. The Blue Route - This is another easy route but a slightly shorter 12km option. It does however have some single track through indigenous forest and redwood trees. The Green Route - This is a more difficult 15km circular route which offers dramatic glimpses of the coastline and dense coastal forest. The Red Route This 24km Red Route is more challenging with stretches of single track, take in the scenery along coastal cliffs with some extreme downhill and uphill. * Please be aware that the trails (except the Yellow Route) may be closed just after heavy rain. All Harkerville routes start on the N2 opposite the Garden of Eden Department of Water Affairs and Forestry kiosk. Maps are available at the Garden of Eden kiosk. This scenic ride is 22kms through forest and mountain fynbos. Suitable for the majority of cyclists, the trail mostly follows comfortable contours in the plantation and indigenous forest. The existing Storms River MTB route follows the old national road through what is now part of the new Garden Route National Park. From here, the route ascends along the Storms River Pass on an excellent gravel road twisting through spectacular indigenous forest for an easy 2km stretch. Then speed ride down the steep 5km descent, winding to the Storms River below. The climb from the river and onto the coastal bluff is a hard 2 km ride but then the gradient levels out onto the plateau. Take a sharp right and cross the SAFCOL pine plantations following the MTB route markers for a few kilometers of flat riding. Don’t miss the viewpoint over the breathtaking Storms River Mouth and magnificent Tsitsikamma National Park. The return trail cuts through a full-grown pine plantation and eventually rejoins the original route for the difficult 5 km climb back to the trail head. If you are keen to increase the distance of your ride, follow the SAFCOL jeep tracks in a clockwise direction to follow the N2 back towards Storms River Village. Read more about this trail here. We have a great mountain biking route that can be done directly from Tamodi. It is 22km with an elevation of 391m.